Recognizing that forests and sustainable forest management can contribute significantly to sustainable development, poverty eradication and the achievement of internationally agreed development goals, including the Millennium Development Goals, the General Assembly proclaimed 2011 as the International Year of Forests. 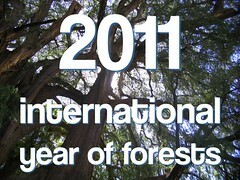 Planeta.com will be updating our guides to Forests and featuring responsible tourism in forests around the world. We will also call for new photos in the World Trees Group on Flickr that document the conservation of natural and cultural diversity in forests around the globe. Recognizing that forests and sustainable forest management can contribute significantly to sustainable development, poverty eradication and the achievement of internationally agreed development goals, including the Millennium Development Goals, the General Assembly decided to proclaim 2011 as the International Year of Forests.